Curious how the Panama Canal works? Before I visited the Panama Canal at the Miraflores Vistor’s Center, I had an elementary sense of how the canal worked. Seeing it up close was amazing, but it’s impossible to observe the journey of a vessel through canal from the sidelines of theof the Miraflores Locks. From a single vantage point, you simple cannot watch a ship travel from the Atlantic Ocean through the Panama Canal to the Pacific Ocean. 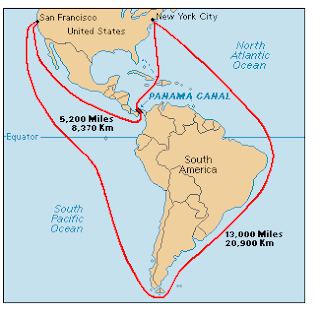 The average transit duration through the Panama Canal is 8 to 10 hours and the average total time time for a ship in Canal waters ranges from 24 to 30 hours. Moreover, the canal is over 40 miles long. To observe this process one would have to be on a ship traveling through the Canal or flying overhead in a helicopter. Visual representations can serve as teaching and learning aids. In the case of the Panama Canal, visualizations can help explain the canal pathway, the rational for building the canal, and how the canal operates. 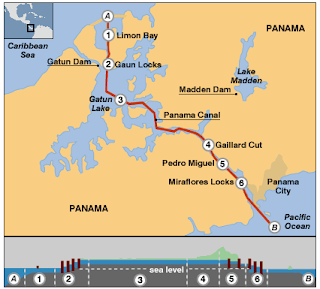 However, with each visual representation of the Panama Canal, there are limitations in what is depicted, scale, directional orientation, point of view, etc. However, a visual accompanied by words can effectively illustrate the workings of the Canal, the location, and approximate a real-life experience of actually going through the canal. To illustrate the pathway of the canal that was build out you can view this topographic map from 1923 (designed 9 years after the Panama Canal officially opened). If one isn’t familiar with reading topographic maps the differences between land and water are not abundantly clear. For instance, the canal (water) is in red and Gatún lake, and the two oceans are simply noted by text. This graphic clearly distinguishes land from water. However, navigational elements are missing such as a compass. There’s a obvious savings in travel time for ships traveling from New York City to San Francisco. This annotated map only tells part of the story, however. There are many ways to illustrate how the canal works through video, pictures, animations, and graphics. These range from authentic live captures of ships passing through the canal to static diagrams of the lock structure. Live video feed (mise en scène) – A webcam recording everything that passes it by. This is good way to provide an “real life” view of the Canal. However, it’s not clear where the camera is and which ocean the ships are approaching from. On the sidelines (objective) – Similar to the live feed, but much quicker. The viewer is watching ships pass through the canal. This is limited by the fact that view is missing a directional orientation. It’s not clear where the boats are coming from and where they are going. In a vessel – A timelapse video give the view the experience of going through the Panama Canal on a ship in under two minutes. Navigational elements are missing. It’s not entirely clear where in the Canal you are during any point in the video. The party boat version – A timelapse video with music. This is an example of a disorienting journey through the Canal. Point of view – A timelapse video where the view is clearly in the captain’s seat. There some textual cues where geographically one is during the selected points in the video. A good way to show a process or flow is to use animation. Animating a ship flowing through the Canal can give one the geographic references needed as well as the operating elements.